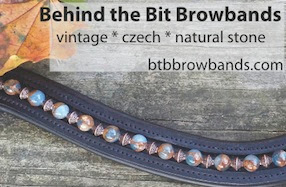 Behind the Bit: I. just. don't. get. it. Who would do this to a broom? Who would put it in a muck bucket upside down. Even wearing glove I don't want to grab a broom handle that's been sitting in a muck bucket. Someone give me a rationale for this behavior. Please. The only clear, rational answer one can come up with is that whoever committed this atrocity was not thinking rationally. That would drive me crazy! At my barn we have a spoon to mix grain, and so of course it gets covered with oil and such. It makes me crazy when people put it away with the handle facing down. Like why would would I want to pick it up like that and get oil all over my hands? I swear people don't THINK! They probably didn't want the bristles of the broom to fold over.... which will happen if you always rest it right-side-up..... but the fact that they stuck the end of it INSIDE the muck bucket is, well..... very silly. I agree I wouldn't like the handle in the muck tub, but to play devil's advocate, perhaps the intent was to allow wet bristles to dry, or to avoid smooshing the bristles out of shape? I'm sorry, but this made me laugh harder than I have all day! It is ridiculous, which makes it funny. Thanks for the chuckle! Yeah... preserve the bristles is the only theory I can come up with. Still... ewww! Don't most people have a place to hang their broom? We do, and so does every barn I've worked at. Hanging it solves the problem of bent bristles AND the problem of dirty handle. I don't see what you're motified about. It is quite obviously demonstrated by the damage being done to the other broom in the photo that it is upside down to preserve the bristles. I always keep my broom with the bristles upright. I don't find horse poo abhorrent - don't we all clean horse poo off our nag's bums/tails without a second thought? Sure, I come into contact with poo by way of cleaning up (I muck my horse's stall daily)--but most of us don't plunge our bare hands into a pile of poo willingly. The fact that I've NEVER seen anyone do this says something, I think. If the bristles are a concern,hanging implements from the wall is preferable. I'm tickled by the fact that there is the other broom and fork right next to the bucket. My first thought was maybe the bucket and implements were a gift - the bucket still has its sticker on it - but, at second glance, the broom is rather used. What's hanging on the wall to the right of the bucket and tools? I dare say the person has done the best they can in the absence of a suitable broom hanging device. 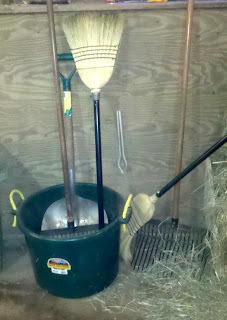 There has to be more interesting things happening in the barn than someone's broom storage. Everything in the picture looks neat. What's the fuss? Oh, hey, ANONYMOUS. Sorry you don't find it to be your cup o'tea but I don't blog to please everyone.